The first requirement of a major connector is rigidity. This allows stresses that are applied to the partial denture to be distributed effectively over the entire supporting area, including the teeth, underlying, bone and soft tissue. Other components of a partial prosthesis can only be effective if the major connector is rigid. Flexibility allows forces to be concentrated on individual teeth or edentulous ridges causing damage to those areas. Major connectors must avoid impingement of the free gingival margin. The major connector must never terminate on gingival tissue. In maxillary castings the border of the major connector should be at least 6mm to 8mm from the gingival margin of the teeth and in the mandibular it should be at least 3mm from the gingival margin. Patient comfort should be a consideration when designing the major connector and food traps must be avoided where possible. (a) The need for support. (b) The number and location of teeth to be replaced. (c) The number of clasps. A maxillary major connector should have a prepared seal along all borders that contacts soft tissue (food line). This seal forms a beading that will slightly depress the soft tissue. The food line (or seal) is scribed into the master cast to a depth of 1mm and width of approximately 1.5mm. The food line prevents food debris from collecting under the major connector. The extra thickness provided by the seal enables the metal to be tapered into the tissue surface without loss of strength. Usually, an intimate contact between the palatal soft tissue and the connector is required so there is no relieving of the tissue. It also provides a point where the casting should be finished. TYPES OF MAXILLARY MAJOR CONNECTORS. The presence of palatal tori. The need for indirect retention. 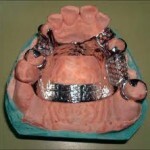 The need for stabilization of infirm teeth. The mental attitude of the patient. There are six types of maxillary major connectors. 1. Single Posterior Palatal Bar. Narrow, half-oval in shape with its thickest point at the centre. The bar is gently curved and should not form a sharp angle at the junction with the denture base. Very limited use, usually when one or two teeth are missing on one side of the arch only. Where there is minimal need for palatal support and minimal interference with phonetics. Wide (minimum 8mm), thin band of metal that crosses the palate in an unobtrusive manner. Suitable for use when only one or two teeth are being replaced on either or both sides of the arch, and the denture is to be tooth borne. There is minimal need for palatal support but more than a palatal bar. Also there is minimal interference with phonetics using this type of major connector. 3. 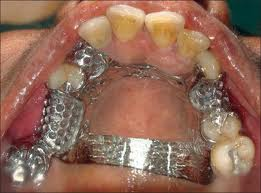 Double Palatal Bar (A-P Bar). Anterior portion is narrower than palatal strap. Posterior portion similar to single posterior palatal bar. This configuration gives the effect of a circle. Used when the anterior and posterior abutments are widely separated and full palatal coverage is not desirable e.g. tori palatinus. Offers very good rigidity. A thin band of metal running along the palatal surfaces of teeth and extending onto palate. There are three principle applications. When several anterior teeth are being replaced. When a toris palatinus is present and does not allow for posterior coverage, or when mobile anterior teeth require stabilizing. 5. Closed Horseshoe (Anterioposterior Palatal Strap). 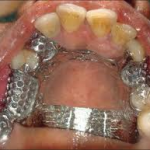 Similar to horseshoe with palatal strap connecting both sides of the arch posteriorly. Generally indicated when numerous teeth are to be replaced and when a toris palatinus is present. When periodontaly weakened teeth require stabilizing. This is structurally strong and rigid. The posterior border extends to the junction of the soft and hard palate. It is similar to a full denture, the difference being that it is made of an alloy instead of acrylic. Indicated when all posterior teeth are to be replaced bilaterally. Also when anterior teeth require replacement along with bilateral free-end saddles. When flat or mobile ridges are present, the palate can offer stabilization for the prosthesis, if a patient has well developed muscles of mastication and complete mandibular natural teeth, heavy occlusal forces can be anticipated. A complete palate will offer support against vertical displacement.